Mother Nature provides us the biggest, the bright-est, the largest and the loveliest beauties. Out of the natural beauties, the Sun stands first in beautiful appear-ance and in giving us life. The Sun is a huge glowing ball at the centre of our solar system. The Sun provides light heat and other energy to Earth, The Sun is one of the hundred billion stars in the Milky way galaxy and is about 25,000 light year from the centre of the galaxy. The Sun revolves around the galactic centre once about every 250 million years. The Sun has 99.8% of mass in the solar system and is 333,000 times as massive as Earth. The Sun like most other stars, is made up mostly of atoms of the chemical element hydrogen and almost all the remaining matter consists of atoms of seven other el-ements. For every million atoms of Hydrogen in the entire Sun. there are 98.000 atom of Helium 850 of Oxygen. 360 of Carbon 120 of Neon 110 of Nitrogen 40 of Mag-nesium 35 of Iron and 35 of Silicon. Most of the energy emitted by the Sun is visible light and a related form of radiation known as infra red rays which we feel as heat. The Sun also emits a particle radiations, made up of pro-tons and electrons. 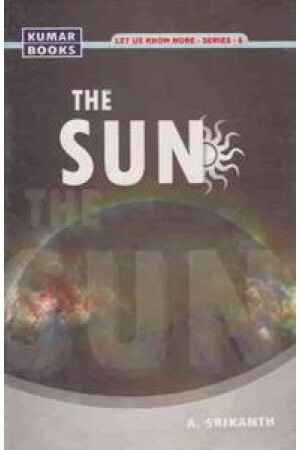 This book tells much about the Sun, and provides a good amount of information of facts about him in an easy and lucid language interesting and useful for all those who wish to know something and more about the Sun. It is fully illustrated.